To fit a play of 19 characters onto the tiny stage at Barons Court Theatre (about the size of the average single bedroom) is no mean feat, but Green Girl Productions somehow managed this on their opening night. Their interpretation of Shakespeare’s Tempest, whittled down to 12 central characters, took the tiny room by ‘storm’. With absolutely no set to speak of other than a bin in the middle of the room, the actors had the mammoth task of materialising the entirety of Prospero’s island with no visual aid. They lurched themselves into a frenzy to create the storm at sea, used their voices as part of the soundtrack, and really utilised the three sides of audience round the stage to full effect. There was also a lovely musical element to the play, with the actors banging their own drums, casting ‘spells’ with eerily held notes and Ariel (played by Nicola Foxfield) singing ditties with a wonderful, piercing voice. This is, however, not a play for those enamoured by the theatricals of theatre-going. This interpretation is quite simply actors, with their words, on a stage, and even those with a love for minimalism may find it hard to stay focused throughout. The dialogue lacked a bit of drive, and it would have been nice to have had some atmosphere-enhancing visuals, or moments dedicated to really relish the time-old brilliance of the dialogue. There was nothing shy about this play – they filled out the room with strength and loud presences – but it smacked slightly of an amateur effort. 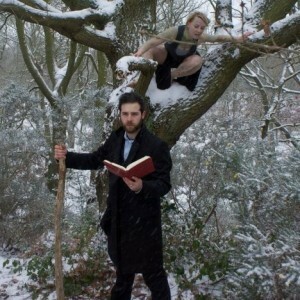 The Tempest runs @ Barons Court Theatre until 17 February. Tickets are £12 - £15.